I’ve often said that it’s easy to wreck an Airstream by neglecting it, but it’s hard to wear out an Airstream by using it. Despite a long hiatus in this blog, our Airstream has seen a fair bit of use over the last ten months. I haven’t been writing about it because I felt, after 12 years of continuous blogging (Vintage Thunder, Tour of America, Man In The Maze) that it was time to take a long break. The break was not just from blogging, but also from tackling new projects like books and events. We’re just doing Alumapalooza now—instead of Alumafiesta, Alumafandango, Alumaflamingo—which gives us time to attend other events that other people are hosting. That’s kind of a novelty for us. Last February Eleanor and I hit a Greater Los Angeles Airstream Club event in Palm Springs during Modernism Week, and it was refreshing to just float along while someone else sweated the daily details. I spent a chunk of the winter and spring closing out projects so that when we hit the road in May, I’d be able to focus on traveling across the country with Eleanor and Emma. This might have been the last time we ever do this together, since Emma is now 18 and heading toward all the obligations and opportunities her age implies. 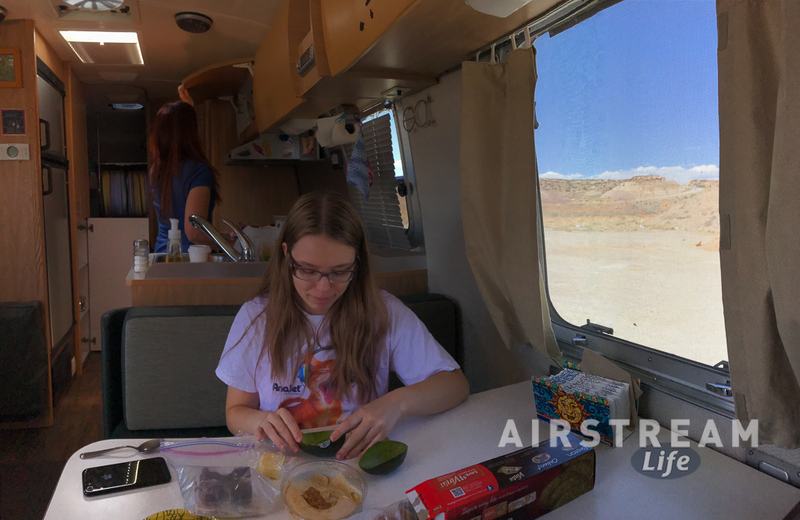 We did nothing exceptionally different on this trip compared to any other year, but for me there was a certain tinge of sadness in the background because I knew it could well be the end of a wonderful era of Airstreaming as a family with our daughter as a child. We spent a couple of days in Moab with our friends Koos & Stefan, a couple of weeks at the Airstream factory doing Alumapalooza, another day or two in Ohio with Loren & Mike, and a few other small stops. Every time we stopped it felt like a farewell tour. Here’s the kid one last time. Enjoy, because the next time you see us she’ll be an adult and we’ll be empty-nesters. Traveling together is all we’ve known since Emma was a toddler. What will we do next? The summer, mostly spent in Vermont, slipped away like a dream in the morning. There were the traditional activities of a Vermont summer, like Farmer’s Markets on Saturday morning, dinners with friends in the Champlain Valley, fishing and boat rides on the lake, a motorcycle trip for me (to Nova Scotia), trips to the Boston area to see other friends and family, concerts & movies & fireworks … and then before the sweet corn and blueberries were ripe, it was time to fly Emma back home. She’s there now, managing by herself, living on her own. For the first time in her life she’s bound by a school schedule. She’s driving around in her car, looking for a part-time job and prepping for college. 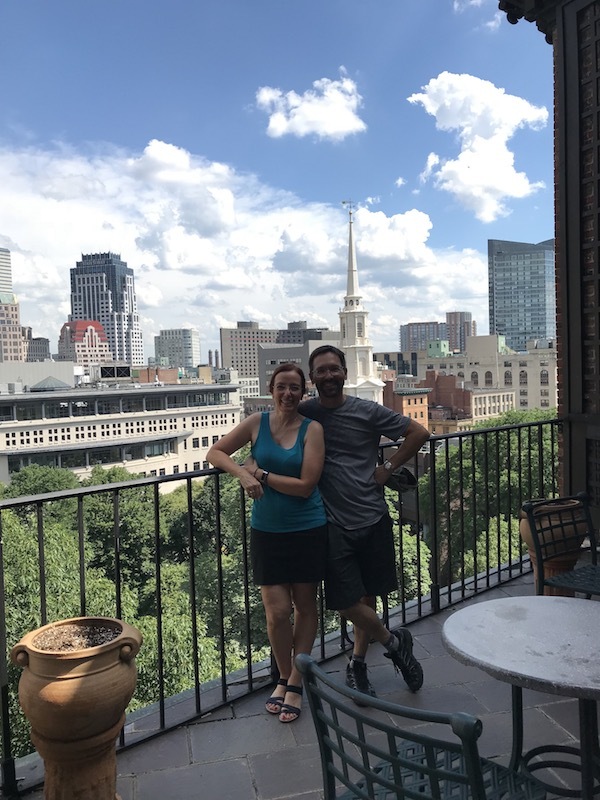 Eleanor and I, on the other hand, find ourselves in the northeast with a 30-foot Airstream and a lot fewer obligations than we’ve had in the past two decades. This would seem to be an enviable situation—lots of time and eight wheels ready to roll—but we are both still adjusting to the concept. Several times we have considered downsizing from the 30 foot Safari Bunkhouse but ultimately we know that this Airstream suits us pretty well even though it is quite a bit bigger than we need. Fourteen years of upgrades and customizations have resulted in a travel trailer that fits us like well-worn leather jacket—and Airstreams really don’t wear out if you take care of them. And that brings me back to the first sentence of this little essay. After sitting still in Vermont for two months it finally came time to hitch up and head west. I always have a little sense of unease on the first day because it’s the day that all the little things that have gone wrong during storage become apparent. The first travel day of a long trip is usually the hardest one for me. The week before we were scheduled to go I began to run through the usual pre-trip prep, like filling the propane and re-organizing our supplies for travel. The night before departure I checked the tire pressure and found that one of them was a few pounds low, so I removed the tire pressure sensor and pumped it up. The next morning, that tire was completely flat. What happened? When I removed the sensor, a tiny rubber gasket that seals the stem apparently fell out. Without this gasket, the sensor will leak air. (This was easily verified with a few squirts of soapy water solution from my “little things” toolkit.) Unfortunately, I somehow forgot to include the little baggie of spare gaskets that is provided with every TST sensor kit, so I just removed the sensor for now and will replace it later. By itself that wasn’t a big deal, but it led to the discovery that my 23-year-old air pump was ready to die, and it did so with a pathetic “cough” just as it completed the job. Farewell, old friend. So our first stop of the trip was to buy a replacement, and truth be told I like it a lot better. Since we have a “whole house” inverter on our Airstream, I can now use a powerful 120-volt AC pump instead of that anemic 12-volt pump. These sorts of bugs really slow down the departure day. You think you’re going to get somewhere and then stuff happens. It was noon before we had everything squared away, which led to us not getting very far. At first this was frustrating but then Eleanor pointed out that we’re not on a tight schedule. We’ve got plenty of time to get to Arizona. For the next 2-3 weeks of travel across the country Eleanor and I have time to think. This trip is more than just a drive home; it’s a chance to gain perspective on what our future travels will be like. The trailer is bigger and quieter without Emma, but also less energetic and thrilling. Much of what we saw and did over the past 15 years has been channeled through our child, infused with her spirit and freshness, and I’ll miss that. What will the next two decades of travel be like? I think we can only find out by moving forward, rather than bemoaning the inevitability of our little girl growing up. She’ll always be a part of it even if it’s only via picture messages and phone calls. Eleanor and I will hitch up again in the morning, and see what the road brings. I was writing my Editor’s column for the upcoming issue of Airstream Life the other day, and part of it touched on the recent spread of Airstream’s product line. I’d like to expand on that here, because the space I allot for myself to bloviate in the printed magazine is very limited. Once upon a time, and for several decades, Airstream meant aluminum travel trailers almost exclusively. There were a few experiments here and there with fiberglass (such as the “Wally Bee“) and with canned ham styling (the “Wally Byam Holiday” trailer), but otherwise Airstream stuck to what they knew. Even the painted Argosy trailer line in the 1970s was still mostly the same construction beneath. The Airstream motorhomes of the 1970s were essentially trailer bodies laid atop commercial truck chassis. Even though the idea of an Airstream motorhome was initially unsettling to travel trailer purists, at least the final product resembled the beloved shape of the iconic Airstream trailer. Sadly, things went downhill from there for a while. Airstream made a few stabs at expanding the product line in the 1980s and beyond, introducing creatively-challenged products such as the Legacy fifth-wheel series and white-box Land Yacht motorhomes, both of which were virtually indistinguishable from any other manufacturer’s if you removed the AIRSTREAM labeling. Those products might have been good for the bottom line at the time, but nobody remembers them fondly. Around 2004-2005, when it became clear that the Class A motorhome business was dying, Airstream stopped producing white box motorhomes and began to try to think a little more out of the box—or perhaps “away from the box”. The first experiment was the Airstream Westfalia, a Mercedes Sprinter-based mini motorhome based on the popular James Cook sold in Europe. 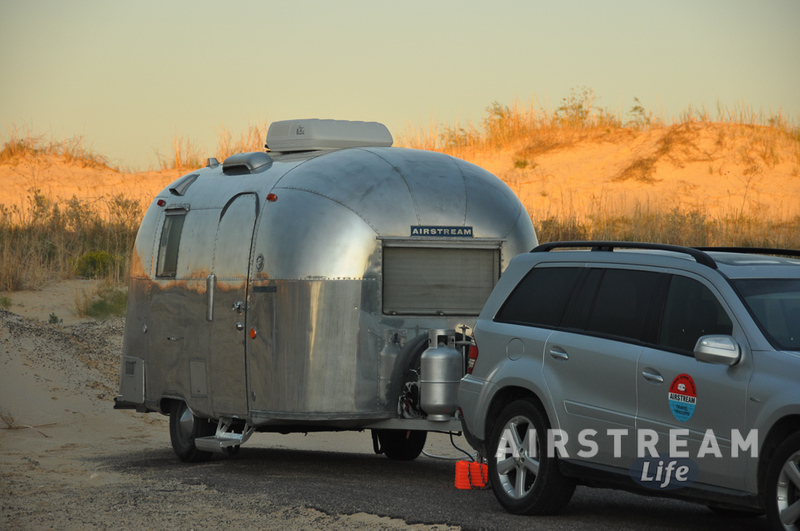 Airstream imported it and upfitted it to meet US standards starting in 2004. I thought the Airstream Westfalia was a really cleverly-designed motorhome with a ton of potential, and so did Airstream leadership for a while. But dealers in the US didn’t seem to know how to sell it and Airstream buyers didn’t “get” it. At $85k or so (more than PleasureWay and RoadTrek competitors at the time) you’d want to really be convinced this was the right choice before buying. Only about 192 were imported before Airstream killed the product. 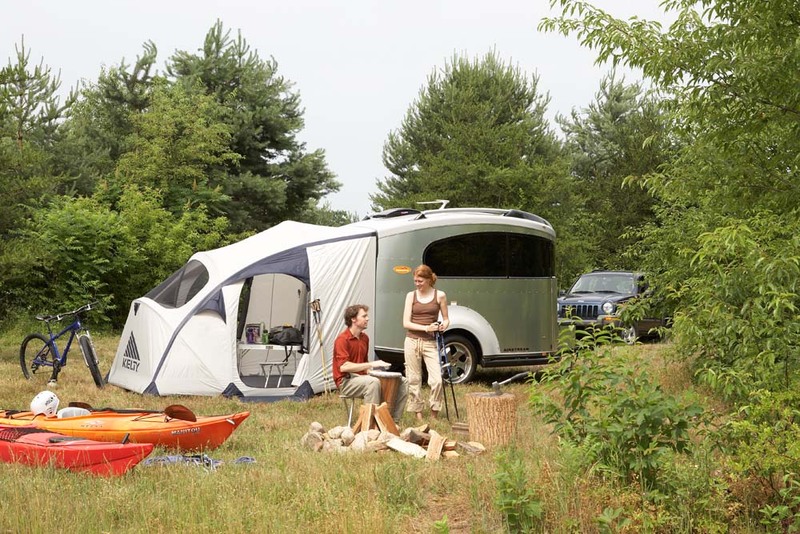 Then they tried the Basecamp, as a sort of rolling sporting goods hauler designed for Millennials and Gen-X’ers who hopefully would not care that it lacked a real kitchen, any sort of bathroom, and cost about $25k. Unfortunately, it turned out that the target market did care about those things. The optional Kelty tent for the rear didn’t save the original Basecamp from being compared to an expensive horse trailer. 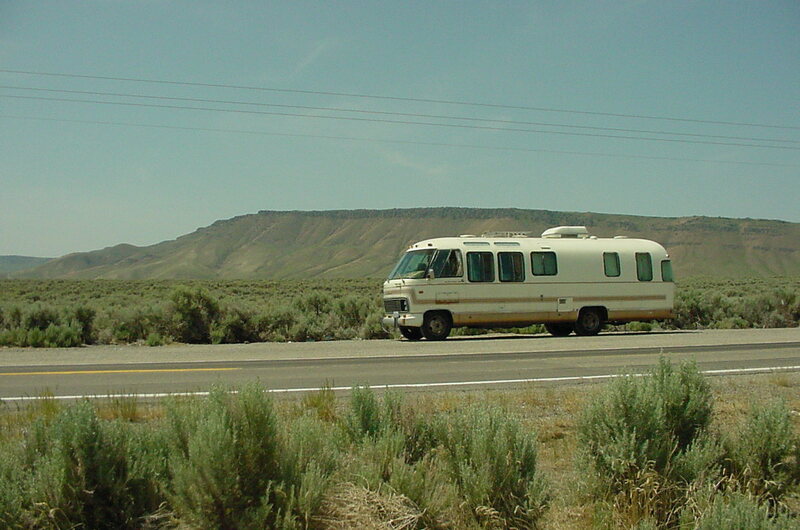 Around the same time Airstream brought out the first Interstate motorhomes, based on the Mercedes Sprinter 2500 chassis. These Class B motorhomes were moderately successful as far as I know, but the real leap forward came a few years later when it was completely re-designed on the Sprinter 3500 chassis (dually rear wheels) and upgraded in just about every way possible. 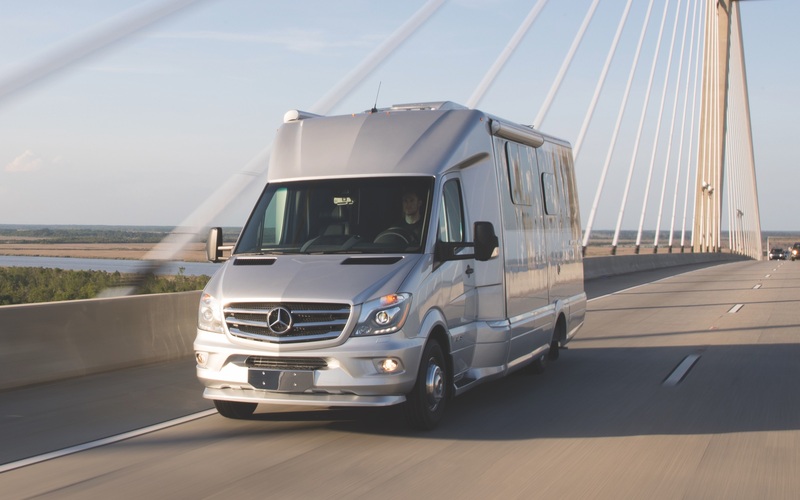 Suddenly, Airstream couldn’t make enough of them, and even with the price rising from the $90k neighborhood to $150k+ over the past eight years, the Interstate has become the most popular diesel Class B motorhome on the market. 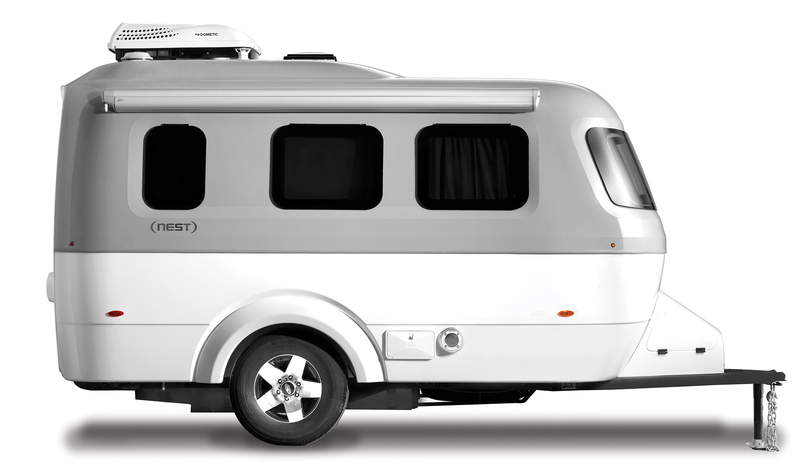 For comparison, Airstream is selling this tight little 25-foot Class B for more than they had been selling their much-larger “white box” style Class A motorhomes in 2005! In 2011 Airstream tried to dumb down the Interstate to attract a lower-budget audience by building it on a Chevy gas van platform. The short-lived Airstream Avenue was the result. It was a “me too” product: looked like everyone else’s B-van and didn’t have the elite Mercedes diesel drivetrain. There’s a good reason you’ve probably never seen one on the road. It bombed. I think at this point the light went on for Airstream management. If making the Interstate better was the secret to success, maybe the earlier failures were not because they were too expensive relative to the competition—but not expensive enough! People didn’t want cheap Airstreams, they wanted better ones. In that context it’s not surprising that the Basecamp eventually came back with a full kitchen, full (wet) bathroom, and lots of clever innovations that transformed it from a essentially empty shell to a functional travel trailer, without compromising the sporty aspect. It’s more expensive than the original design. And now they sell. Well, since Airstream has cracked the code and the economy has been humming well for the past couple of years, Airstream’s new problem is keeping up with demand. Their response has been to come up with more cool ways to go traveling. For example they bought the design of the fiberglass Nest trailer invented by Robert Johans and will be producing that later this year. The upcoming Winter 2017 issue of Airstream Life will have an in-depth interview with Airstream senior managers that reveals why they bought Nest, what they’re thinking, and how it will fit into the Airstream family. The other news this month has been that Airstream is launching yet another new product, a Class C motorhome called “Atlas”. 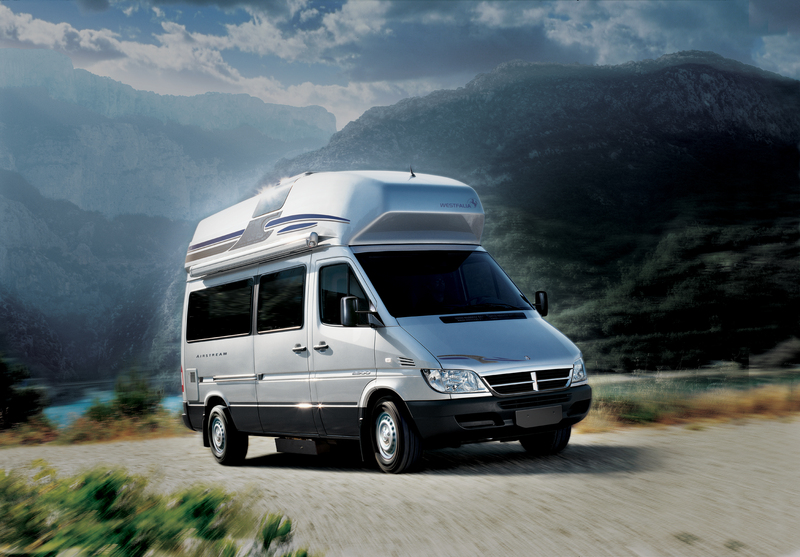 It’s also based on the Mercedes Sprinter 3500, but it’s much larger than the Interstate and priced at over $200k. 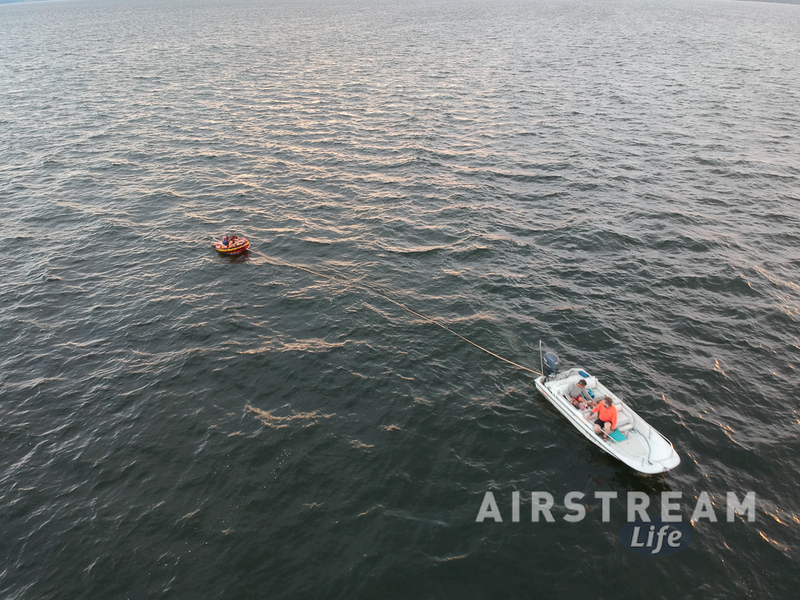 (We’ll take a close look at Atlas in the Spring 2018 issue of Airstream Life.) This means Airstream will soon be selling five separate lines: Atlas, Nest, Base Camp, Interstate, and the classic aluminum travel trailers. People often ask me if Airstream is just cannibalizing its own products. Well, of course they are smarter than that. If the Base Camp was eating into sales of the Airstream Sport 16 and 22-foot travel trailers (which are priced slightly higher), they would have noticed and done something about it. But so far every new product they’ve launched in recent years has found a new audience, expanding Airstream’s customer base. Atlas and Nest are expected to do the same. This all sounds great for Airstream, and great for all those people who are now going to get an Airstream (Nest, Atlas, Basecamp) who would otherwise have not bought an aluminum travel trailer. But did Airstream think about my needs? Noooooooo. I still get those letters from time to time. In fact last week someone wrote a lengthy note with their non-renewal, listing all the article categories that they didn’t like as well as a helpful list of the exact articles they’d like to see in the future. The letter concluded by saying that only if I complied would they consider mailing me $24 for a year’s subscription in the future. 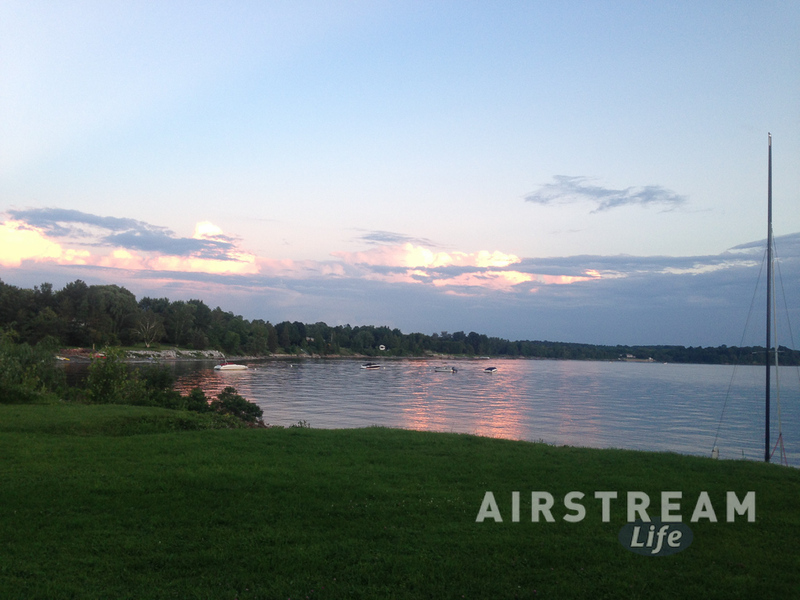 I try to explain to people that Airstream Life is not about the trailers. It was never about the trailers, or the motorhomes. It’s about the other things that Airstreamers are interested in: community, history, art & design, technology, destinations, etc. Sure, we talk about trailers and motorhomes, but if you look at any issue you’ll see that most articles are agnostic, talking about great adventures or ideas. Whether those things happened in a trailer or motorhome, vintage or new, it doesn’t matter. At least, that’s what I hope. So in this respect I try to be a Great Unifier. Or to be more accurate, I try to help keep the Airstream community from fracturing. I’ll keep touting the message that no matter which Airstream you own, you’re a part of Airstream Life. Special interest groups within the Airstream community are cool, but in the end we’re all people united by a common love of travel, adventure, learning, socializing and —well, to be honest—eating. Kipple slowly saps your energy and your money, like negative chi. It keeps you from being able to move forward creatively and efficiently, trapping you in a world of what was instead of what could be. I am very devoted to the future and not very attached to the past, so I’ve been looking at the stuff–>clutter–>kipple connection around our home base and trying to figure out whether things fit into our future or are just boat anchors. The boat anchor-type items will get cleared out. Surprisingly, one of the big items that made my hit list is our beloved 1968 Airstream Caravel. This trailer has some real history with my family, as it was our first Airstream, and the inspiration for Airstream Life magazine and all the things that have followed it. We’ve kept it in fine condition—in fact, considerably better than when we found it, thanks to a major renovation—but in the last few years we have rarely used it. Almost everything about it has been repaired, replaced, upgraded, or polished. And yet it sits, because a 17 foot Caravel just isn’t what we’ve needed for the past decade. It was a lovely trailer when Emma was three years old and we were taking weekends all over New England and Quebec. Everywhere we went people would stop us and ask about it, beg for a tour of the interior, and say “That’s a cool vintage trailer.” But Emma will be old enough to vote in a few months and three adults in a 17 foot trailer just doesn’t work very well for our style of 5-month roadtrips. Still, over the past few years I’ve kept everything in working condition and ready to go at a moment’s notice just in case we might decide to pop out for an old-fashioned camping weekend. I’ve kept it insured to the tune of $600/year (on a more expensive “Agreed Value” policy since the trailer is fairly valuable), locked with a Megahitch Lock, battery charged, and in a prime spot out of the sun and rain in our carport. One of my favorite memories of the Caravel was in 2004 in Florida, when we decided to spend a day at the beach near Bradenton. We parked the Caravel next to the beach in the regular lot and used it like a cabana for the day, staying to watch the sunset long after all the other visitors had gone home, and then making dinner before heading away. It was one of many blissfully peaceful times we spent in that old trailer. Memories like that tempt me to keep the trailer just a little longer, in the hope that somehow we’ll recreate them. But life has moved forward: Emma is driving herself around, making her own plans, and we’ll never have a 4-year-old toddler again, nor will we ever be in our early 40s again. I’m looking forward to the things we can do now, instead of wishing for experiences we can never repeat. The Caravel, to its credit, has a long life ahead. It is too nice to become kipple, so rather than let it sit and slowly deteriorate we’ve over-invested in maintaining it (as vintage owners often do). It is stocked and trimmed and ready to travel. Just about everything from the axles to the roof vents has been refurbished or replaced. Marmoleum flooring, AGM battery, gray tank, PEX plumbing, and aluminum propane tanks are just a few items on a lengthy list of upgrades. Someone else will benefit from all of this, and hopefully love it as much as we have, and probably take it on many adventures of their own. If you know someone who might want this trailer, or are interested yourself, there’s more detail here. But before we let the Caravel go, we are taking one last trip as a family this week. 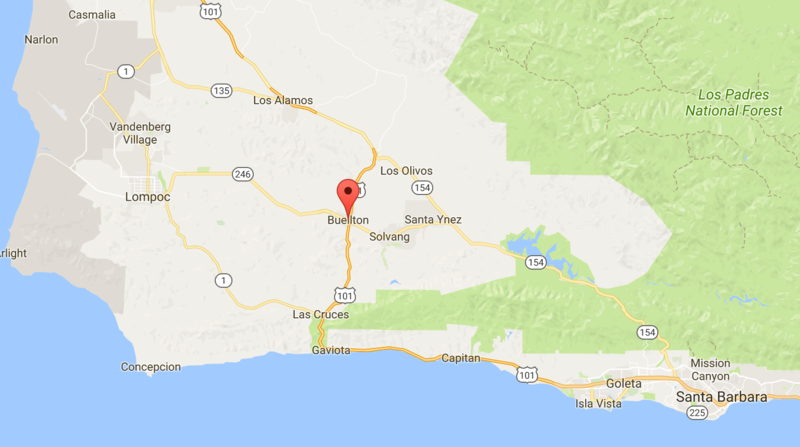 We’re going to the 8th Annual Buellton Vintage Trailer Bash in Flying Flags RV Park, Buellton CA. Nearly 200 vintage trailers will be there! Our good friend David Neel runs this event and it has been on our “must do” list for years. Finally, we’re going to make the 600 mile trip with our vintage trailer and join the fun (and hang out a “For Sale” sign). We’re doing a lot more downsizing of “stuff” than these two examples, but you get the idea. I’m upbeat about it. I’m not forced to clear out stuff, I want to. Clearing out the cobwebs and stuff we don’t use will open doors we can’t even imagine yet—and I believe that the longer we avoid kipple, the longer we’ll avoid becoming kipple. And the Caravel will be happier too, when it’s back on the road and seeing America as it was always meant to. After such an absence from this blog—the longest continuous blank spot since I started blogging in 2005—I wonder where to begin. These days social media, blogs, and such demand a continuous stream of updates and trivia, even if there’s nothing to say. I find myself wishing for the days of paper correspondence again, where a month or two away wouldn’t be considered unusual. 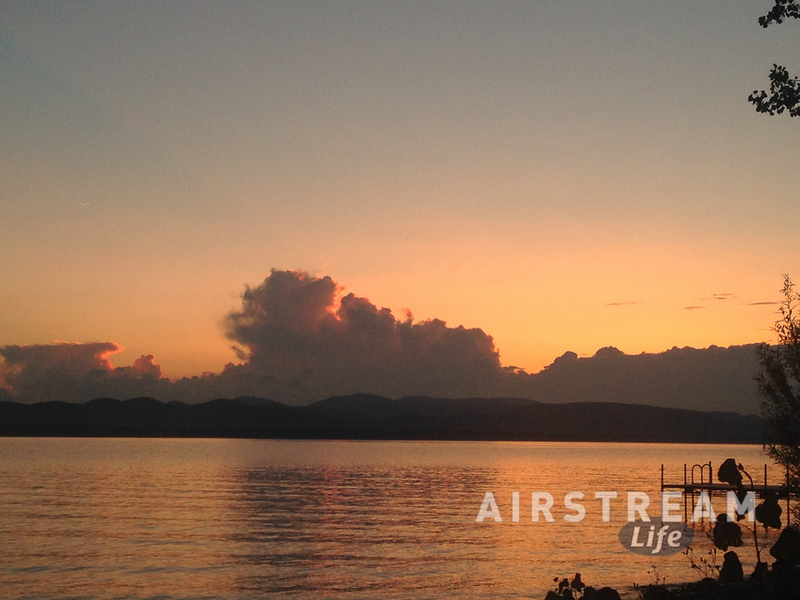 Certainly much has happened in the Airstream Life world and personal life, but we’ve done no Airstream travel since arriving in Vermont back in early June and so I’ve been disinclined to fill this blog with other details. It’s not that I felt no one would be interested; it was more a matter of trying to live in the moment. That’s because this season marks a milestone for us. Our summer location for the past decade (the place where I grew up) on the shores of Lake Champlain is going away. The house will be sold and a family tradition will come to an end. No more Tiki Bar parties on the beach, views across the broad lake to the Adirondacks, Frisbee on the lawn, tubing on the lake, sunset dinners on the deck, and nights sleeping in our Airstream beneath the old cedar trees. Knowing this, we’ve savored each day of the short and sweet Vermont summer. That sounds sad, but I prefer to look forward. The memories of past summers and the life-shaping experiences we’ve had can never be taken away from us. Rather than bemoan what is gone, we’ll be looking to new opportunities here in Vermont and in other places. From our years of Airstream travel I have learned that there is always another adventure around the corner, if we just bother to break out of our mental rut and go look for it. There are lots of fun things pending indeed … Some of our Vermont traditions are perennial, like evening trips to the ice cream stand, weekend Farmer’s Markets, boat rides on the lake, blueberry picking, sweet corn on the cob, the County Fair or Fire Dept BBQ, daytrips to Montreal … all those low-key and local activities that seem so small but end up being fond and important moments in retrospect. None of those things are going away. This year we added a few things to our repertoire which will help make up for what we can’t do next year. 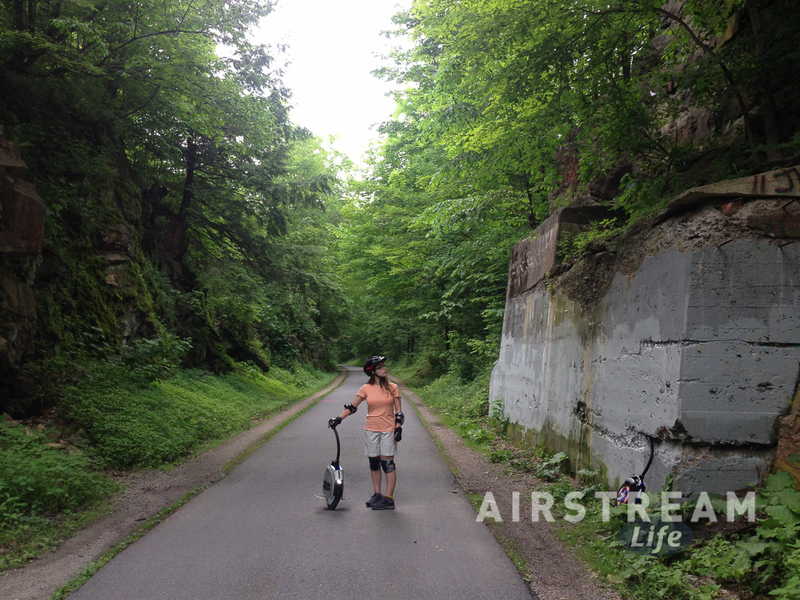 Emma and I have had a blast exploring bike trails and urban areas on our electric unicycles, for example. After years of borrowing motorcycles for annual rides around New England and Canada, I finally bought my own (an eBay steal) and outfitted it with luggage for week-long tent camping expeditions. The first major trip was across New Hampshire and Maine to Acadia National Park in July. It was a flawless trip. The guys are talking about a bike trip to Cape Breton, Nova Scotia and Prince Edward Island next year, so there’s another nugget of the summer that will be retained. But I remind myself that every year is different. None of us will ever be this age again and so we must seize the opportunities we have right now, or possibly forgo them forever. It’s not about what we can’t do anymore, it’s about what we can do. Everything new we do has a chance to be the next cherished memory. 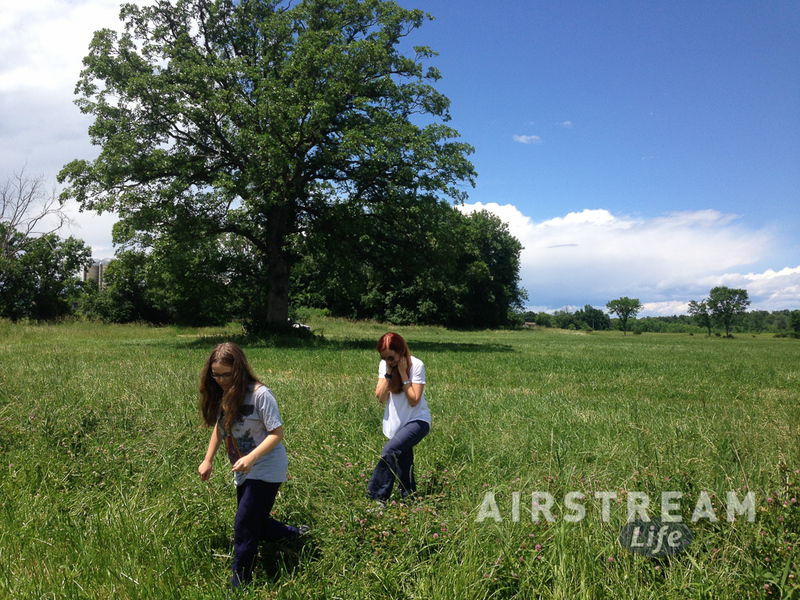 Or as I always say, Airstreaming is not about where you go, it’s where you stop—and the things you do when you get there. Our Airstream has traveled exactly zero miles in the last 60 days but nonetheless it has made possible a wonderful summer. Now it’s winding down for us. Obligations in other places are clamoring for our attention, and we’ll be getting on the road soon. Today is a prep day: cleaning the Airstream inside and out, testing systems that haven’t been used in a while, re-packing and shipping excess stuff home, making rough travel plans, etc. It’s the lead-up to yet another adventure, so even the prep work comes with a certain excitement of anticipation. I’ll try to remember to live in the moment, even as we launch across the country knowing that a heap of obligations and responsibilities await us. A summer of savoring has been good practice. But now that summer is almost over, I’ll also try to balance that with more regular updates so that I can share experiences and lessons as we go. Each year we head out of the rapidly-building Tucson heat for a massive cross-country Airstream trip that lasts all summer. Each year we end up in Vermont parked on the shore of Lake Champlain because that’s where family members are—but along the way there’s a great road trip. Usually we get back home sometime in September or October, although one year we came back in November. It all depends on obligations and opportunities. Trip-planning is great fun. With a vast American continent to cross there’s no end of tempting detours and stops. With an Airstream we get to take our time and meander, spend time with friends, drop in on lesser-known spots, and (very important) try all kinds of interesting things to eat. The problem is not finding places to go, it’s deciding which ones to skip because even with a month to travel each way there’s never enough time to do it all. What a great problem to have. The key is not to be in a hurry or afraid. Being in a hurry causes people to take the Interstate when they don’t really need to, and miss everything except what’s at the exits. Being fearful causes people to avoid the unfamiliar, which is a shame because that’s where all the interesting stuff is found. So each year we try to break away from the places we’ve been before (except a few favorites or the unavoidable) and go someplace completely unknown to us. That is getting harder each year. Our Airstream has crossed the country at least thirty times, and for the last decade our route has been from Tucson to Jackson Center, Ohio, for Alumapalooza each May. I’m not sure there are many more ways to cross the Plains states. At this point the Airstream could probably drive itself there, like a horse pulling a carriage on a familiar route in the 19th century. Sometimes inspiration comes from the oddest places. One year I spotted a random article about “Forbidden Amish Donuts” and that instantly spurred a memorable detour through Amish country in western New York state. We’ve detoured for rallies, snorkeling, free parking, business meetings, to see snow, to get away from snow, national park badges, photo opps, factory tours, festivals, beaches … you name it. The point is, with the Airstream we can do that. I do get asked a lot how I can “take five months of vacation.” Of course, I don’t—I’m working all the time as we go, just like many other Airstreamers. These days it’s a lot easier to get online and work from most of North America. In the early days it was a rather tedious experience getting online. Now my cellular Internet is faster than my home Internet. Our favorite part of the route is always in the Four Corners region, which is why we’re willing to add a few hundred miles and spend hours toting our trailer up and down the mountain passes of Colorado. This year I’m not sure what exact stops we’ll make but the wide open spaces of the west make it easy to find great campsites. The only thing I know for sure is that we’ll avoid Moab this year. The campground in Arches National Park will be closed all summer and the others in the area will be heavily burdened in May. There’s a rally in Fort Collins CO happening in mid-May, and we plan to attend that. I will probably do a maintenance presentation there. After that there’s no avoiding the Great Plains and the tedium that is associated with long drives in that area, but I think it will be made better by avoiding the numbing sameness of I-70 through Kansas in favor of Route 36. The planned route ends where it always must, at the doorstep of Airstream in Jackson Center OH for Alumapalooza. It will be interesting to see how Jackson Center has grown and changed with Airstream bursting at the seams lately. And after that? Not sure. We’ve got thoughts of meeting one of the printers I work with in Ohio, visiting family and friends in Pennsylvania, doing genealogical research, camping in the Adirondacks … but who really knows? It’s fine at this point to have a list of possibilities and a general goal (Vermont by a certain date). We’ll wing it on the rest. Come along with us for the ride, through this blog. We hit the road in mid-May.